Reopened shortly after my last "review" having been smartly refurbished in a modern style with brown leather sofas, grey/green paint scheme and wooden floors. Restaurant at one end with bar at the other and now known as "The Swan on the Square". I tried pints of Tiny Rebel's Cwtch and Swan Brewery's Cygneture on Saturday, both were priced around the £3 mark and in good condition (not the best pints in town though). Otter Bright is the regular handpulled ale but I stuck with the guests. Live music here on a Saturday night every so often - there was a band belting out (murdering) "Stand and Deliver " when we were walking back to our B&B later on in the evening. It's now back on our "worth visiting when in Kington" list. 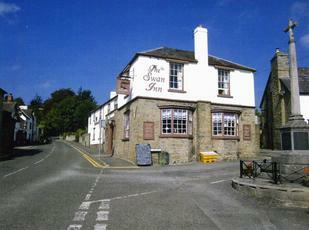 Under new ownership and currently undergoing refurbishment. Returned to the Swan this year and what a suprise........Friday night was a great night out with good band plus excellent beer. Now a freehouse, the real ale Ramblers ruin was a real treat. Lynn and Shaun have worked hard to improve decor and ambience of the hotel and bar. Drank a few pints of London Pride, group of 4 of us. Other real ales were Priory Ale, Tetleys & Harvest Pale, sampled all of them. Excellent pint! Asked for a bar snack, staff more than happy to oblige even though kitchen staff had just finished shift.